Denise O'Sullivan is one of Ireland's key players. COLIN BELL IS no stranger to Norwegian football. Between 2015 and 2016, he managed Avaldsnes — a team based in Rogaland. 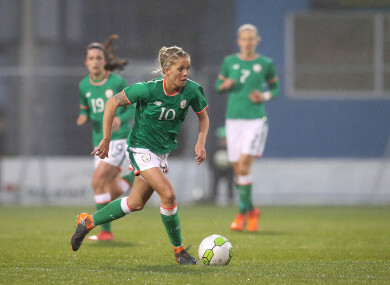 Consequently, when Ireland Women play Norway in Friday’s crucial 2019 World Cup qualifier, Bell’s team could potentially face three of his former players – Maren Mjelde, Elise Thorsnes and Ingrid Ryland. “Maren is probably one of the best players I ever coached,” he says. One player who will not be part of the Norwegian team, however, is Ada Hegerberg. Winner of the Uefa Best Women’s Player in Europe Award in 2016 and BBC Women’s Footballer of the Year for 2017, the 22-year-old Olympique Lyonnais striker, who Bell describes as “world class,” has decided to take a break from international football. “Every team who has Ada in the team is much stronger than they would be without her,” Bell explains. “But I think the team in general has really taken off after a disappointing Euros. They’re playing some really good football. Friday’s game is the first of a double-header with Norway, who the Girls in Green travel to face once more on 12 June. While Hegerberg’s exclusion is a boost, the Irish team have absences of their own to worry about. Megan Campbell (Man City) and Stephanie Roche (Sunderland) are long-term absentees while Roma McLaughlin (Shelbourne Ladies) also missed out on the squad having just returned from injury, as did Ruesha Littlejohn (Celtic), who picked up a knock in the Netherlands game. Heather Payne, Amy Boyle-Carr and Saoirse Noonan similarly do not feature as they prepare to sit their Leaving Certificate. There also several players doubtful for both games. Ireland may be forced to do without Marie Hourihan (calf strain), Niamh Fahey (ankle ligament damage), Amber Barrett (ankle) and Harriet Scott (knee). “They’ve all come in [to training], because we’re hopeful that they could possibly play in the second game [if they don't make Friday],” Bell adds. One bit of positive news is the return of Wexford Youths striker Rianna Jarrett, who has overcome three ACL injuries at just 21. Already in the Women’s National League this season, she has looked impressive, beginning her campaign with an laudable tally of nine goals in seven appearances. “It’s good to have her back,” Bell says. “She’s done very well so far this season in Wexford. But again, it’s a player that’s not 100% fit. I want her in so she can see what we’re about, she can see players like Denise O’Sullivan, Diane Caldwell, Louise Quinn — how fit they are, and what they actually do to get that fitness. Rianna is probably one of our most gifted players, but without that fitness, just the talent is not going to be beneficial. So that’s why she’s in. The fitness of players, and in some instances lack thereof, has been a topic Bell has frequently discussed since his appointment as Ireland boss in February 2017. With the English women’s football season having recently ended, it could also potentially be a significant factor in these forthcoming games. “They’ve obviously kept themselves going and it also applies for some of the Norwegian players as well,” Bell explains. “Fortunately for us, the last few games of the season [at club level], Katie [McCabe] was playing over the distance, which she wasn’t before the previous camp. “She played a few games before the Cork camp, looked very sharp and good. And then from Cork until the last camp, she probably played in all, about 20 minutes. And you could see the difference. “I made a statement — I need players to have completed at least four 90 minutes from our game against Netherlands to now, and [Katie has] obviously accomplished that, which is good for her, and it’s also good for us. And while not everyone can have a perfect season, Bell has been particularly impressed by certain individuals, singling out Diane Caldwell, Denise O’Sullivan and Louise Quinn for praise. “Like Louise, Diane has played 22 matches this season for Sand from the first until the last minute. Louise have been playing the football of her lifetime [with Arsenal]. “So we’re pleased with those girls who have been playing and Katie’s now been playing the last few games, having some good games as well. Denise, I’m watching her games on the internet. Normally late Sunday afternoon or evening, I’ll be watching her games from the Saturday and we’ll be texting each other. So it’s great for her to get that feedback and she’s been playing some excellent football, and they’re top of the league, unbeaten. Players who don’t have the benefit of being at professional teams face an even bigger challenge when required to step up to international level. Bell expects the players in question to do extra work away from their clubs in order to remain in his good books. “Every player decides where they play, what country they play in, what team they play for. If a player remains in the Women’s National League, that’s fine with me, but they need to be covering at least four, maybe five training sessions a week. Maybe not Peamount, Shelbourne, Wexford, but the players. And the majority of the players have definitely stepped it up to four with the home-based session, plus three in the club, so we’re definitely making progress there. World Cup qualification, of course, would provide a huge boost to soccer in this country, but it’s easier said than done. Norway are the group’s top seeds and clear favourites for the upcoming games, with Bell suggesting they are on a par with the Dutch in terms of quality. Aside from the two Norway fixtures, Ireland have just one qualifier remaining — at home against the North, who they beat 2-0 in Lurgan last September. Theoretically, they could still make it through with two draws in addition to a win against their neighbours, but in all likelihood, they will need to prevail in at least one of the Norway games to retain any realistic hope of qualification. And Bell is reluctant to look too far ahead when asked whether there are plus points to be taken from the campaign regardless of the outcome of Ireland’s final three qualifiers. “I wouldn’t look back positively if we lose 8-0 on Friday and 10-0 on Tuesday, and lose 5-0 against Northern Ireland. But up to now, we’ve made progress and I think we can definitely see that. There are some good young players coming through. We’ve got Zara Foley coming into the squad, she’s just turned 16, from my U17 team and we’ve got another bunch of kids — I’m waiting now for them to turn 16, because they’re promising, they’ve got quality, they’re fast, they’re energetic, they’re good on the ball, they’re tactically getting better, so we’re moving in the right direction, but it’s step by step for me. I want to concentrate on Norway. After the campaign’s finished, we can analyse and move on, but we’re definitely moving forward. Email “'I'm watching her games on the internet... We'll be texting each other'”. Feedback on “'I'm watching her games on the internet... We'll be texting each other'”.